After centuries of development that has severely decreased their size, wetlands now face a different threat: sea level rise. 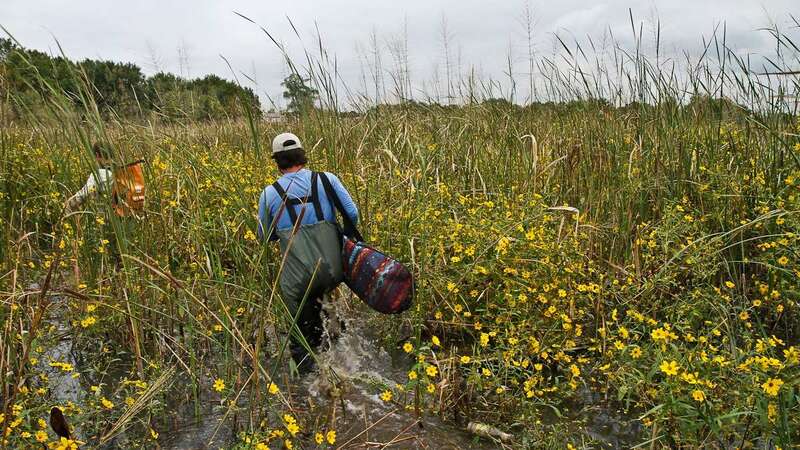 Wetlands, historically seen as the smelly armpit of American habitat types, have more recently been heralded for the flood protection and water filtration work they do. Today, after centuries of development that has severely decreased their size, they face a different threat: sea level rise. 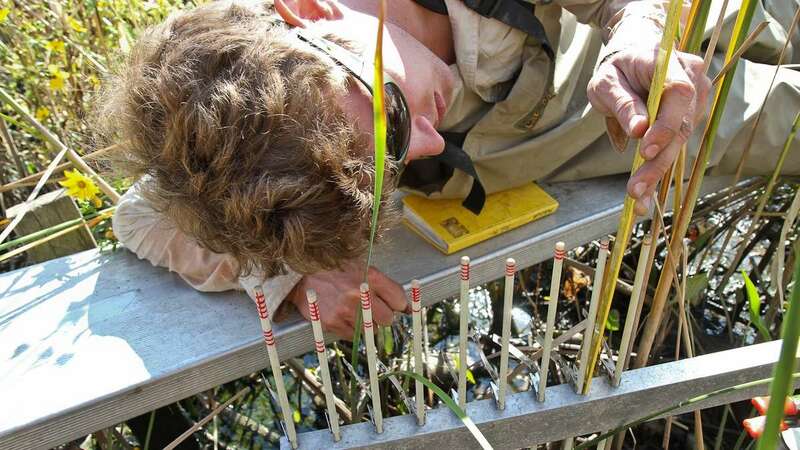 Local ecologists are tracking the impact of sea level rise at sites in the Delaware Estuary and Barnegat Bay, in an effort to learn whether these fragile ecosystems will survive or be permanently flooded by rising seas. Can soil deposits match rising seas? 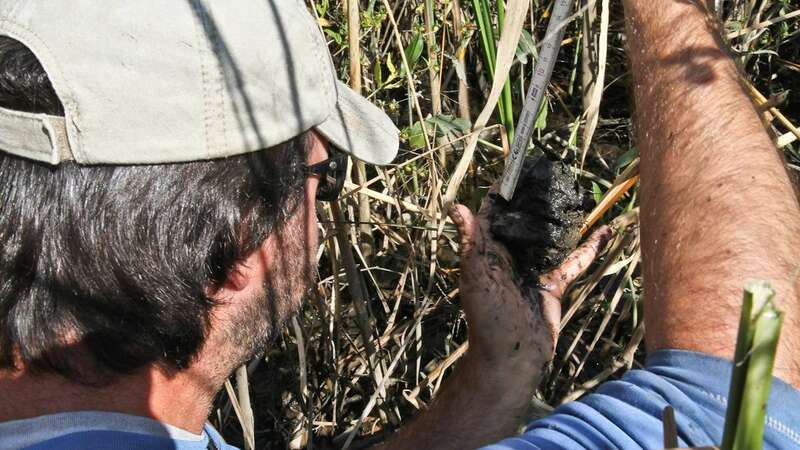 Academy of Natural Sciences wetland project coordinator Kirk Raper said preliminary data show three of the ten sites they visit as part of the Mid-Atlantic wetland monitoring project have experienced scientifically significant levels of sediment accumulation. Another site closer to the coast, at Island Beach State Park in Barnegat Bay, N.J., appears to be sinking. 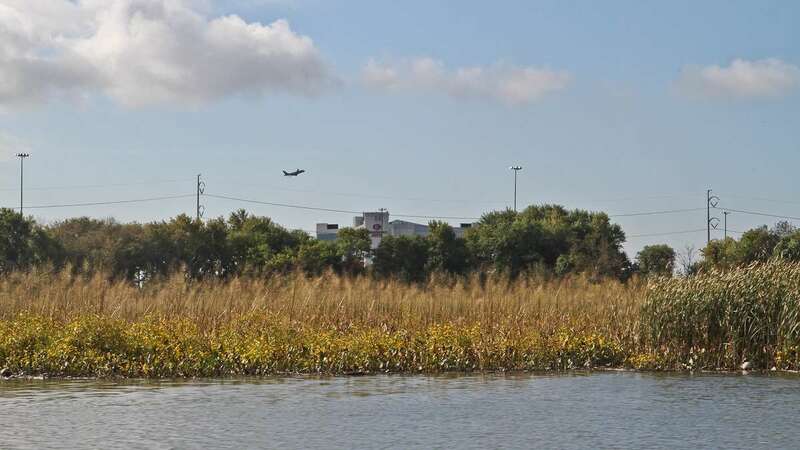 “It used to be a marsh, but now it’s sunk below the water line and there’s just these giant pools all around our research area, the vegetation no longer grows there,” Raper said. At Dennis Creek, in southern New Jersey on the Delaware Bay, saltwater is creeping into areas where it didn’t used to be. “There’s white forests, some might call it a ‘widow-maker forest,’ because all the trees are dead, where the saltwater has worked its way up the marsh,” Raper said. Generally, marshes grow in elevation by trapping sediment flowing downstream, and producing plants that die off and add biomass to the marsh floor. 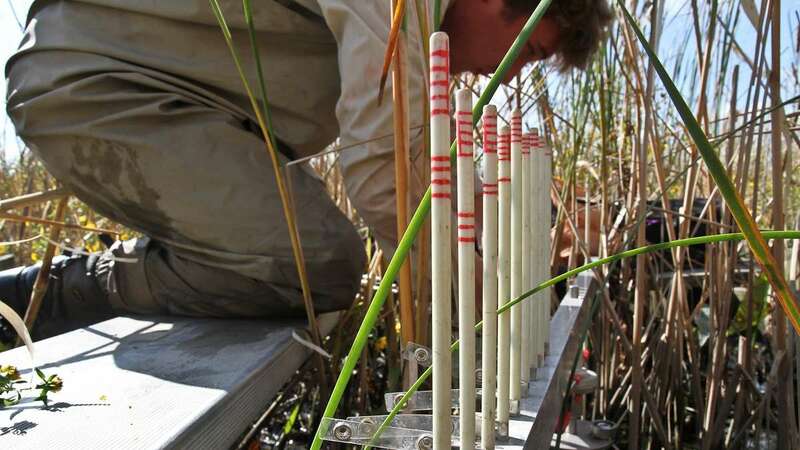 “(We measure) the changes of elevation of the marsh surface over time, as well as accretion rates, which is like sediment deposition,” Raper said, to understand the rate and reason for marsh growth at the test sites. Last Friday, Raper and Academy wetlands technician Michael Archer visited test sites at the John Heinz National Wildlife Refuge at Tinicum, an oasis near I-95 and the Philadelphia International Airport. 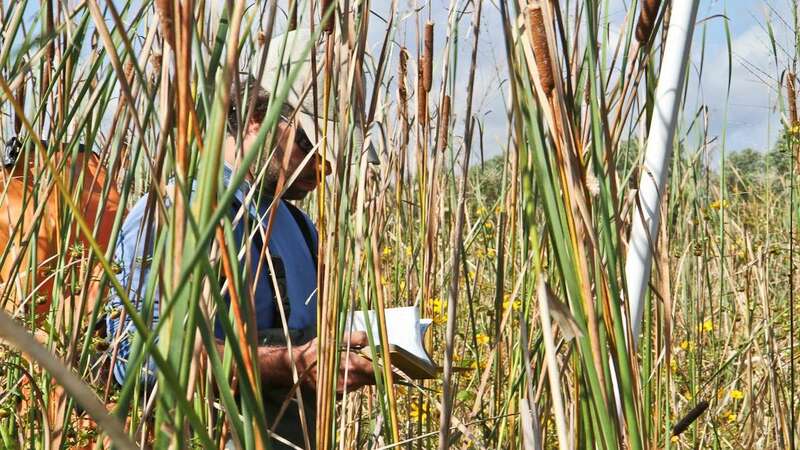 Archer and Raper boated to the edge of a stand of wild rice, cat tails and yellow blooms in the Tinicum marsh, then trekked in muck past their knees to the first of three test sites. Raper used a metal pole submerged deep into the marsh floor to measure elevation. “That will show you the elevation currently, and we can compare that to how it was before, and see whether it’s grown or sunk over time,” Raper said. A few meters away, Michael Archer knelt in mud with a silver kitchen knife, cutting a core of soil in a patch where a layer of powdered white feldspar mineral was laid out three and a half years ago. After pulling up a clump of mud from the marsh floor and identifying the white feldspar line, Archer measured the distance from there to the top of the soil. At this patch, about an inch of sediment has accumulated since the marking layer was laid down in the spring of 2011, the year monitoring for most of the study sites started. 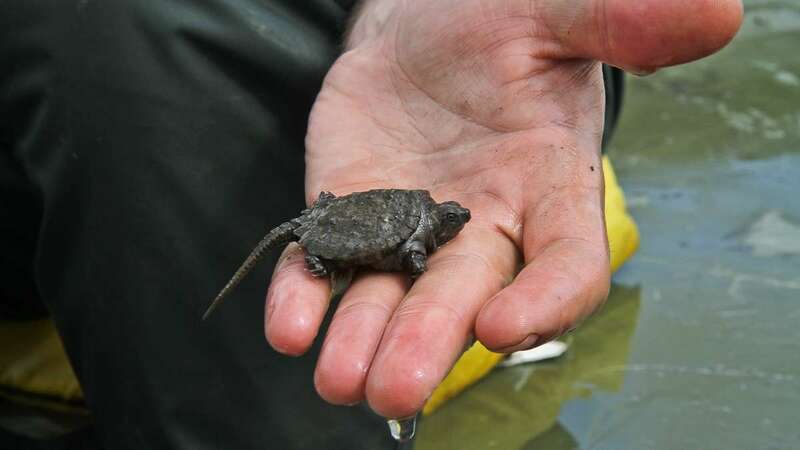 Though initial data looks potentially promising at Tinicum, because sediment accumulation is a slow process that varies by location and season, Raper cautions that it is too soon to say whether the wetland here is keeping pace with sea level rise. The John Heinz National Wildlife Refuge preserves the last 200 acres or so of what used to be 5,000 acres of freshwater tidal marsh. Before settlers arrived in the Delaware Valley, wetlands covered much of south Philadelphia and Wilmington, and stretched north to Trenton along waterways. As far back as the 1640s, according to the U.S. Fish and Wildlife Service, Swedish settlers diked and drained the marshes around Tinicum to create grazing land for their livestock. As Philadelphia became more urban, coal ash and trash from the growing city was dumped into marshes, raising the elevation so houses, businesses, stadiums and the airport could be built. The trend here is mirrored nationally. According to the Environmental Protection Agency, wetlands have shrunk by more than half in the continental U.S. since the 1600s, a loss the size of California. Coastal wetlands have diminished even more. 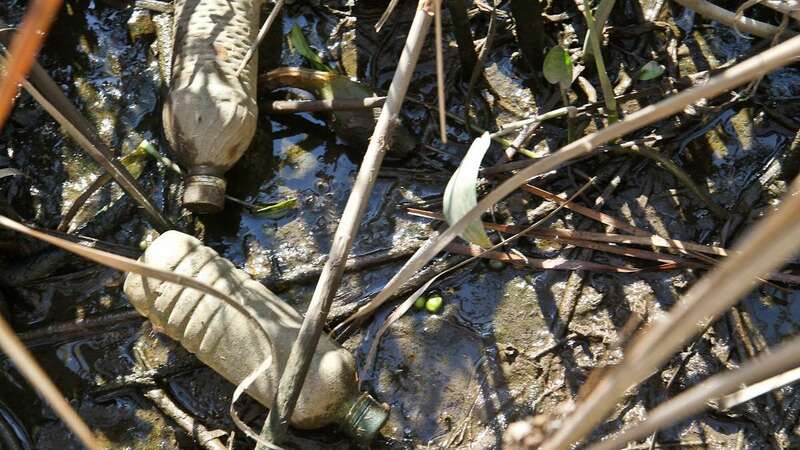 “Wetlands were historically regarded as wastelands, of no value,” said Danielle Kreeger, science director at the Partnership for the Delaware Estuary. 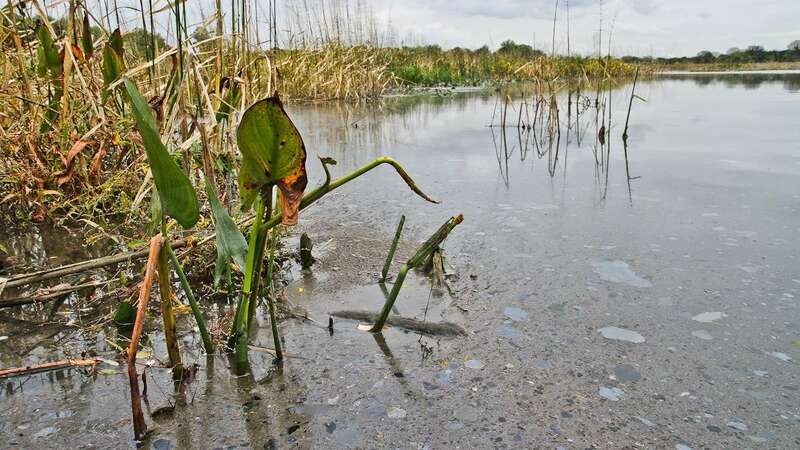 During the environmental movement in the 1970s, attitudes toward wetlands began to shift. “All of a sudden, people started to understand, not only are they important, but they might be the most important habitat type that we have,” Kreeger said. 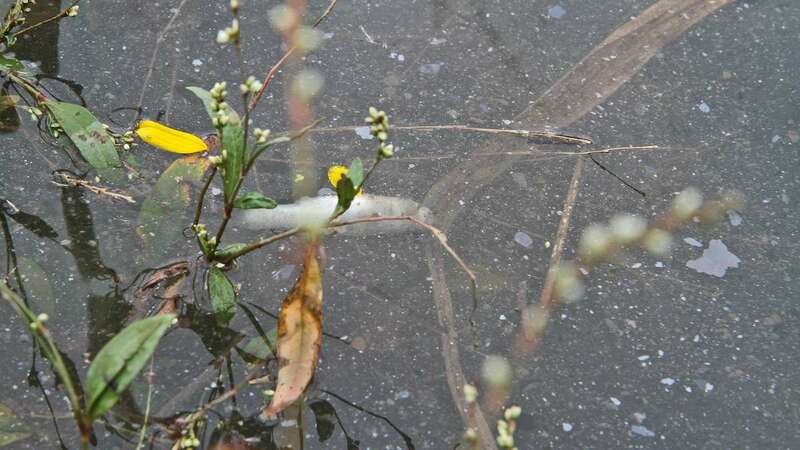 Wetlands absorb water during high tides and storms, which prevents flooding in nearby neighborhoods, and they trap and filter pollution and litter before it flows farther into waterways. Delaware state officials, who are preparing for a half meter to a meter and a half of sea-level rise by 2100, project up to 99 percent of their coastal wetlands will be permanently flooded by then. A 2010 Partnership for the Delaware Estuary report puts the number estuary-wide at 25 percent, though according to Danielle Kreeger, newer modeling conducted after that report was completed pushes that estimate up significantly. “No one’s saying 25 percent anymore,” Kreeger said. 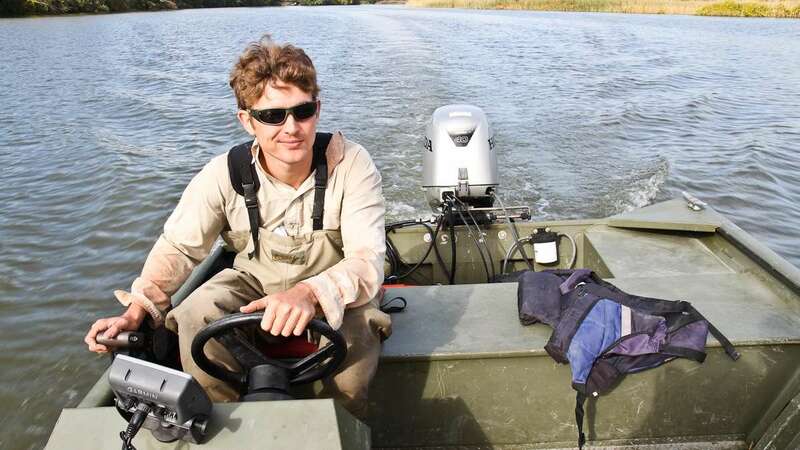 The data Archer, Raper, and other researchers are collecting during the Mid-Atlantic wetland monitoring will help policy makers set preservation priorities for wetlands. Already, conservation groups have begun taking sea level rise into account. 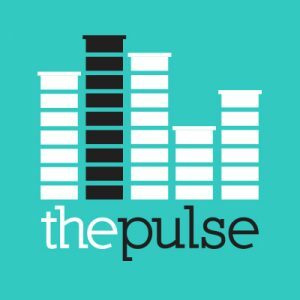 Brian Boutin, director of conservation programs at the Nature Conservancy’s Delaware chapter, said his group has changed its land acquisition strategies. They are shying away from acquiring land directly on the coast, and instead focusing on land inland, places where marshes can migrate once current habitats are permanently flooded as part of the natural evolution of the coastline. Danielle Kreeger’s Partnership for the Delaware Estuary is building “living shorelines” that use natural materials to protect wetlands, instead of concrete bulkheads and rip-rap, which speed erosion. But Kreeger said the conservation tools in her toolbox will only go so far. “The sad fact is we are going to lose many, many more marshes than we can stem the loss of, and so we also need to make decisions about where we’re going to invest to try to stem those losses,” Kreeger said.